This week I explored signage around New York City. I noticed that it was much easier to identify poor signage than it was to find good signage. None the less, I still managed to find a few successful signs. Figure 1 shows a sign on a Javits Center door on the West Side Highway. This sign clearly indicates that the freight delivery check in is through this door. The large white font helps to indicate to truck drivers passing on the West Side highway where to pull over to check in. The Javits Center symbol and name makes it clear that this check in area is meant for the Javits Center. Another effective sign I noticed was in an elevator (Figure 2). I think the fire operation section of this elevator panel is quite effective. It is red which pops out in the event of an emergency. The location of the key hole helps to make sense of the “Normal”, “Hold”, and “Fireman Service” labels and how one might adjust the key to create an action. The buttons to the left however could use some redesigning. Presumably one makes a call while the other cancels the call, however this is not totally clear. Although I discovered many unsuccessful signs Figure 3&4 represent the two I thought were the least effective. Figure 3 is a picture taken at the Franklin Street subway stop in Manhattan. After Aretha Franklin died the MTA decided to put a tribute to her at this station with the title of her most famous song Respect. I think that this a very poor sign. The Respect sign follows the same style and layout as the modern station name signs throughout other New York City subway stations. However this is not a station name this is a tribute to Aretha Franklin. To a tourist, this sign is very confusing. The sign makes it seem like the station name is Respect. 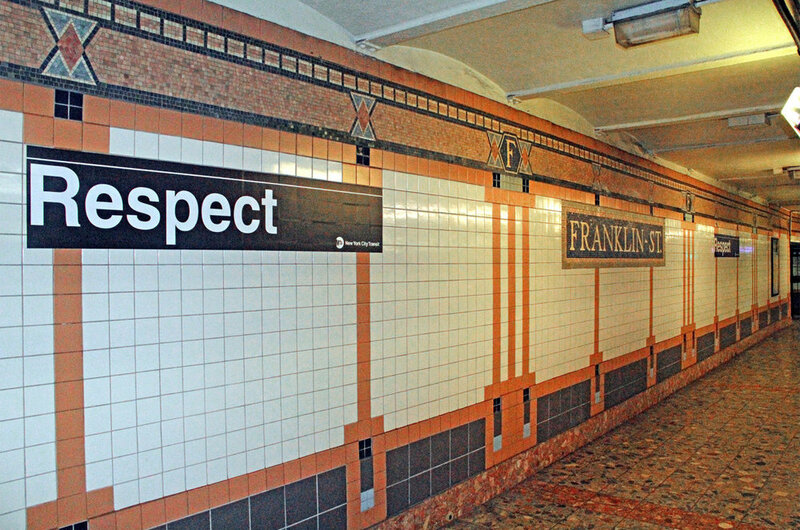 The size of the Respect sign is also the same as the size of the Franklin St sign so you can't even use size hierarchy to differentiate the two. While this was a lovely intention, the execution was definitely not successful. Another unsuccessful sign that I noticed was for a hospital in the Bronx (Figure 4). This sign is supposed to indicate the the Emergency entrance is to the right and there are other Hospital entrances to the right or left. When I first saw this sign I did not realize that the 1st and 2nd Avenue arrows meant that there are Hospital entrances in both directions. Instead, I thought that there was an emergency room entrance in either direction. 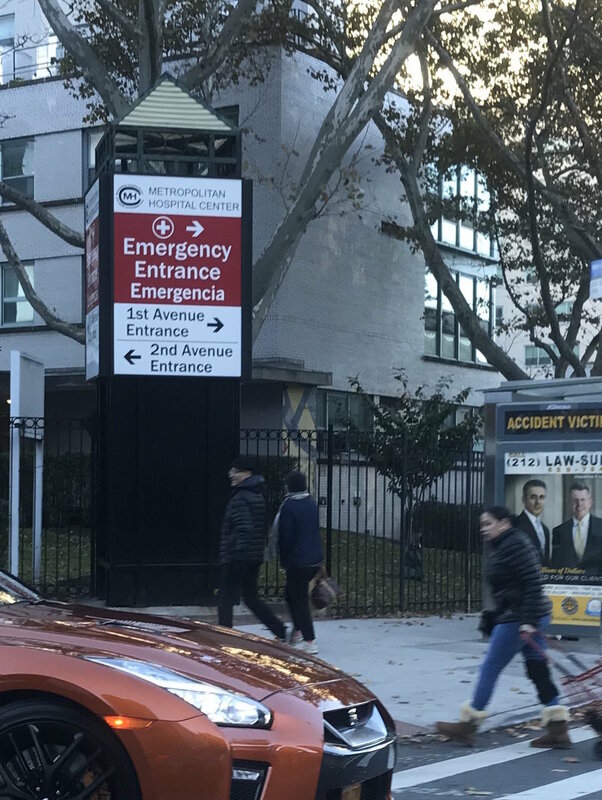 Especially because this sign is meant for very serious situations and for people who are in a hurry I think that it should be redesign so there is no mistaking where the emergency room entrance is. Thus, I decided to redesign this sign. The most important message that this sign needs to convey is the direction of the Emergency room. Thus when the user first sees this sign, their eyes need to go the that message. I think the red part of this sign actually does a good job of that. However, if someone keeps reading the sign, they may get confused by the two other arrows. Thus, I think that this should be split into two separate signs. One sign should be for the emergency room entrance and the other should be for the hospital entrance. Figure 5 shows my initial sketch for the redesign of this sign. Figure 6 shows the final result of the redesign. 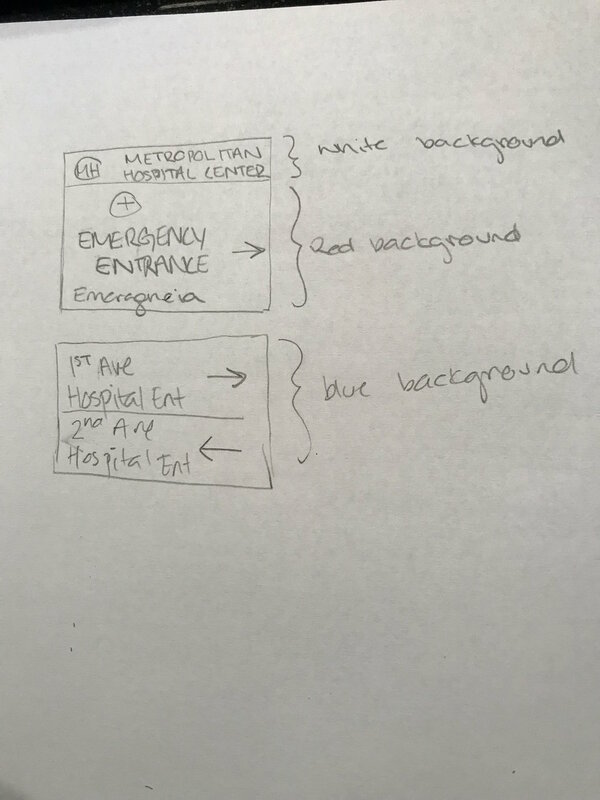 I decided to use color and size of font to differentiate between the emergency room and the hospital signage.